Feel like putting the "test" in testosterone? 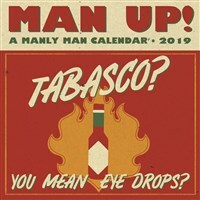 Motivate yourself with all things manly the entire year, that's IF you have the guts! The full color, large format calendar includes large daily grids; six bonus months of July through December 2018; moon phases; U.S. and international holidays. Printed on sturdy, high-quality stock.